Ponca Hills Farm Proudly Sponsors Alison Stroud and Team Landhope at the World Cup Driving Championship. Combined Driving -- What a Thrill! Combined driving is a thrilling spectator sport that fills arenas in Europe and brings the crowds to their feet! For riders, watching the communication not only between driver and horses but from horse to horse is amazing. These equine athletes truly work as a team and their competitive spirit is undeniable. Watch Ljsbrand Chardon's team, 2012 Champions at Budapest, to get an idea of the excitement! When champion combined driving athlete Alison Stroud qualified her four-in-hand Connemara ponies for the 2012/13 World Driving Championship in Budapest, the logistics were daunting. Long time equestrian friend and supporter Jan Mactier made the trip with Team Landhope, sponsoring their bid for the World Cup and helping to field an American Combined Pony Driving team at the international level. Team Landhope and Jan travelled to Pau, France for a second World Championship bid in October of 2013! 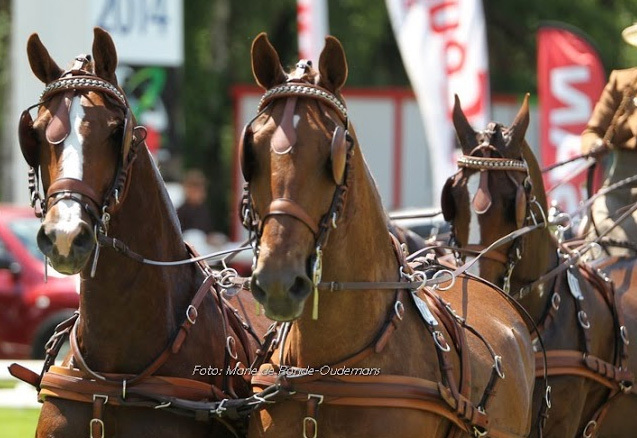 In the Four-In-Hand Ponies, Team Landhope finished 8th overall competing against the Netherlands, Hungary, Germany, Belgium, Great Britain, Italy and France. Ponies Kilkerin Edward, Long Donal, Mosby, Sir Patrick and Mystic showed brilliant teamwork In the Dressage, Cones and Marathon phases. All of us at Ponca Hills Farm are thrilled for Alison and Team Landhope's success!